Jim grew up on the west side of Grand Rapids. He has been married for over 35 years to his wife, Devi, and has four grown children. He received his Bachelors degree in psychology from Calvin College, and his Masters degree in Social Work from the University of Michigan in 1981. After eight years working with emotionally impaired adolescents at Wedgwood Youth and Family Services, he spent the next 15 years in full-time clinical practice as the Director of Counseling at Sunshine Church in Grand Rapids. He served on the steering committee for the Greater Grand Rapids Marriage Policy, and developed marriage and premarital seminars which he presently offers to the community. In 1999 he went to work full time as a diagnostic school social worker for the Grand Rapids Public Schools, evaluating children with impairments involving anxiety, depression and attention deficit disorder. He then worked 7 years as a social worker with Forest Hills Public Schools. 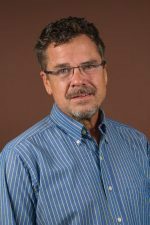 Jim is currently a full-time clinician at Christian Counseling Center. He works with adolescents, adults and couples with a variety of concerns such as depression, anxiety and family issues, specializing in marital and premarital counseling. He has done extensive work in the area of temperament analysis and delivers seminars and workshops to professionals all over Michigan on this topic. Jim participates with Faith Community Outreach, an initiative within Pine Rest that seeks to connect area clergy, churches, and ministries to services available from Pine Rest, as well as developing new services specifically designed to benefit the faith community.